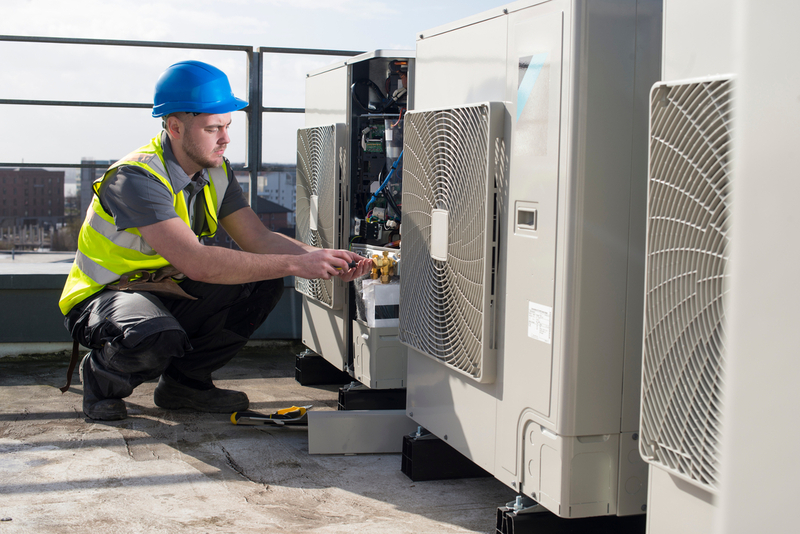 Major shortage of HVAC technicians means big opportunities on the job front. Everyone’s been there. It’s the middle of summer, the temperature outside is reaching high up in the 90s. Thank goodness for central air conditioning. Then, it happens. You start feeling a little warm. The room feels stuffy. You check the vent to see if it’s discharging cool air… nothing. Next you check the thermostat and realize there’s a big problem—the central air conditioning system stopped running. Your heart sinks a bit as one thing becomes painfully clear—it’s about to get extremely uncomfortable. It’s on days like this when there’s one vehicle you want to see pulling into your driveway more than any other—that of the HVAC repair technician. Now imagine calling around to try getting an HVAC technician scheduled for a repair and striking out again, and again, and again. No one returning your calls. No appointments available. No relief in sight. That wouldn’t happen though, right? Actually, it’s not as farfetched a scenario as it may seem. Because right now throughout Pennsylvania and across the country there is a severe shortage of HVAC technicians. And the problem doesn’t look like it’s getting better anytime soon. First, let’s take a look at where the HVAC industry has been. Ask anyone when they think we were first able to manipulate air temperature and movement within buildings through built-in venting systems, and it’s a safe bet that few, if any, would say in the days of ancient Rome. Romans used hypocaust systems to push heated air through a system of air ducts to heat rooms in public bathhouses and saunas. And it was as far back as the Han Dynasty in ancient China—206 B.C. to 220 A.D.—that mechanized rotary fans were used to manually cool entire rooms. Less sophisticated systems have also been around a long time. In early America wood burning stoves were used to heat the indoors. No, there won’t be a test at the end of this. But history here is important. Because it underlines just how much value we’ve placed on heating, ventilation, and air conditioning throughout human history. We want to be comfortable, and will do whatever it takes to make it happen. But comfort is only part of the story when it comes to heating and air conditioning. Obviously staying cool in the summer and warm in the winter is a big reason that the HVAC industry continues to advance with new technologies and innovations. But another one, which we don’t often consider, is safety. Heating and cooling systems use filtration as a way to purify the air being circulated indoors. Filters come in a variety of levels and at different quality grades, but the idea is to limit the amount of impurities in the air like dust, bacteria, allergens, and contaminates—which can have a direct impact on our health. Ok, so back to that thing about a shortage of HVAC technicians. While the first air conditioning unit installed in a U.S. home (which was seven feet high, six feet wide, and 20 feet long) happened in 1914, it wasn’t until the 1970s that central air systems started emerging as the newest trend. With the onset of this new system that blasts cool air through a home’s ventilation ducts came the need for professionals capable of installing and repairing them. The timing here is important. Think generationally. What took place in American society from the mid-1940s up to the early 1960s? Around 76 million of them, to be exact. So right around the time central air conditioning was becoming more and more popular in American homes—bringing with it a need for skilled technicians in the industry—you had a massive generation of workers falling within the age range of 18 to 30. Today, all those baby boomers are, and have been, retiring from the workforce. The numbers are hard to ignore. Now let’s focus on Pennsylvania. According to a recent study by Emerson Climate Technologies, Pennsylvania is #7 in its list of the Top 10 states in which to work in the HVAC/R industry. And O*Net Online estimates that in Pennsylvania alone, the need for HVAC technicians is expected to grow 11 percent between 2014 and 2024. Further, the HVAC/R Workforce Development Foundation Report identifies Pennsylvania as a “Super Hot” state for HVAC workers, with open positions remaining unfilled longer than other professions. And it isn’t just because of retiring baby boomers. Obviously, that’s a big part of the equation. But these massive anticipated shortages are also a result of growing demand. The industry analysis by hvac.com reported that HVAC/R was an $81.1 billion market in 2015, and that it’s expected to grow 5.5 percent each year through 2020, ballooning to a $130.7 billion market in that year. Expanding economic activity, booming construction markets, and increasing demand in refrigeration for food processing and cold storage are contributing to the industry’s impressive growth and subsequent need for skilled technicians. So, you have a huge number of HVAC technicians leaving the workforce, and an industry that’s experiencing rapid growth and would be in need of more technicians even if all those workers weren’t retiring. Kind of a perfect storm for a shortage that could range anywhere from 115,000-138,000 by the year 2022. Now do you want to hear something really startling? With all of this need and hundreds of thousands of open HVAC positions currently on the market as well as on the horizon, only 21,000 students graduated from post-secondary HVAC programs in 2015. There’s simply no way demand is going to be met with such a small number of graduates relative to the number of opportunities in Pennsylvania and across the country. What’s really confusing, is why? According to O*Net Online, the median yearly salary for heating, air conditioning, and refrigeration mechanics and installers is $45,910. In Pennsylvania, that figure rises to $47,390. And entry-level wages are also very attractive at approximately $29,450 in Pennsylvania according to O*Net. Clearly, HVAC jobs offer solid income and, according to projections, excellent security in an industry that will continue to grow. Still, the shortage of trained HVAC technicians across the country and in Pennsylvania continues to be one of the hottest topics within the industry. Another troubling sign can be seen if you look at what’s happening in the landscape of education and training programs in the HVAC field. Remember all those baby boomers retiring from their positions as HVAC technicians? Many of them also are the ones teaching HVAC education and training programs, and are retiring from that, too. In fact, an HVAC/R Instructor Survey indicates that as much as 50 percent of HVAC instructors in the U.S. and Canada plan to retire within the next 10 years. The same survey shows that nearly 60 percent of instructors said that their programs are under-enrolled and have room for more students. Not nearly enough HVAC students to fill the needs, and a dwindling number of HVAC instructors even if those student numbers were to increase. So, if you’re looking for a new career or better opportunities and income, what are you waiting for? The opportunities are abundant. The income is solid. The industry is secure. For anyone looking for a better career or to break into a new career field, HVAC seems primed. Another bright spot is that entering the field doesn’t require a four-year college degree. Most technicians enter the field after graduating from an accredited, associate-level program or certificate that can be completed in 12 to 18 months. But just because it doesn’t require a bachelor’s degree, doesn’t mean any educational program will do. Like all areas of academic study, there is a wide range of options when it comes to the quality of education and training you receive. Also, keep in mind that the best programs out there include an abundance of hands-on training experiences and opportunities, working with the most modern technology and equipment that reflects what you’ll encounter in the real world. To be clear, what you learn in the classroom is essential. As is who you learn from, so make sure you look at the instructors and how much real industry experience they bring. But the key is having ample opportunities to apply what you learn in the classroom on the job, so to speak. In Pennsylvania, there’s a school and program for students interested in studying HVAC that’s proven itself time and again—Penn Commercial Business/Technical School. Located in Washington County, Penn Commercial (the only Lennox Partner school in Tri-State area) has been educating students and providing well-trained employees to businesses and organizations throughout Pennsylvania for more than 85 years. When you blend the staggering opportunities in the HVAC field with the outstanding training at programs such as the one at Penn Commercial, it’s easy to see how powerfully futures can be changed. Additionally, Penn Commercial recently announced a partnership with Lennox Industries—a leading provider of innovative home heating and cooling systems—for HVAC students in a joint effort to address the shortage of skilled HVAC technicians in Washington County and the Tri-State area. Penn’s newly remodeled and expanded HVAC lab now features the latest in Lennox HVAC equipment for students to train with. Welding: Big Opportunities Are Waiting!